Stopping in today to show a really easy Halloween idea. I'm getting ready for one of my show and sales on Sunday and I am super super busy! I show Halloween, Thanksgiving and Christmas so ever spare moment is spent creating. What's underneath those black cat images? Orange Dum-Dums! 1. Download cat images below. I was going to say as easy as 1 - 2 - 3. But I guess it's as easy as 1 - 5. 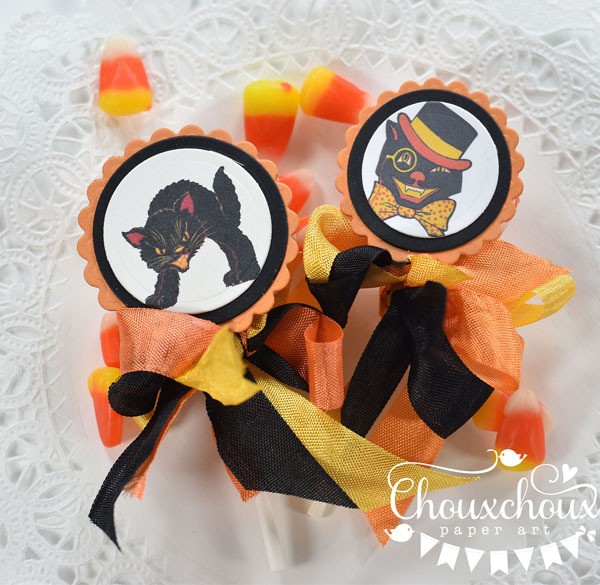 If you downloaded the cute Black Cat Treat Box, these would work perfectly as part of the treats. Update on Challenge: You may have seen in the last post, that I couldn't tell who won. I didn't know that "Pos #1" meant winner. I just found that out today. Pos #1 is Lisa Minkler! Lisa did you get an email??? What a fabulous way to jazz up a lollipop! So cute! I'm impressed at how organized you are to have Christmas goodies ready for your sale! Inspiring! From what I've seen of your creativity, sell outs guaranteed! As I'm from Canada, I'm wishing you a Happy Thanksgiving for this weekend! I love cats! These are so cute! Congratulations to lucky Lisa! These are so cute!...love that cat in the hat! Now that wicked cat does not exactly look like you Lori but but your ides is fantastic! What a super idea Lori - they look fabulous. Hope you have a wonderful success with your sales. how cute, as usual Lori! have fun! Fabulous idea Lori....great way to jazz up treats! These are marvellous, thanks for the inspiration. Happy Halloween! Paper Pumpkins + TV Experience!